The accumulation of fats, oils, and grease can be dramatically reduced through the use of THIOGUARD® technical grade magnesium hydroxide. THIOGUARD® is a strong base, and a moderate pH adjuster, which adds non-carbonate alkalinity to the wastewater. As pH increases, fats, oils, and grease become more soluble. The practical effect on municipal wastewater systems is a rapid, dramatic reduction in fat, oils, and grease buildup within the collection, transport and treatment structures. only to reappear in your plant. THIOGUARD® eliminates the problem, by improving the immediate environment, allowing “good bacteria” to perform their function. 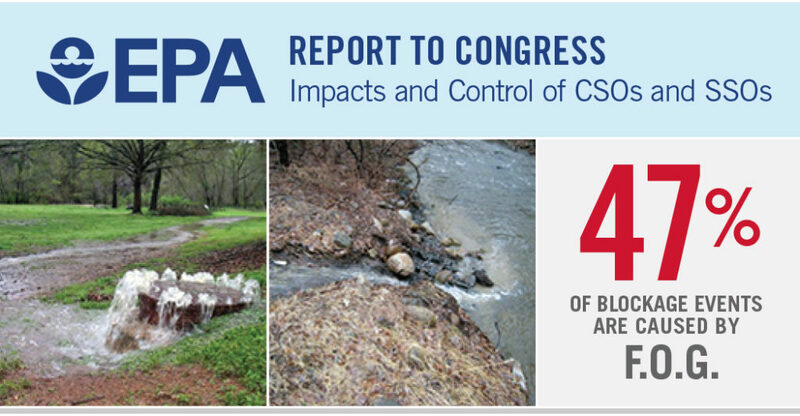 By the time the wastewater reaches your reclamation facility, the majority of the F.O.G. has been either consumed or reduced to simpler organics. 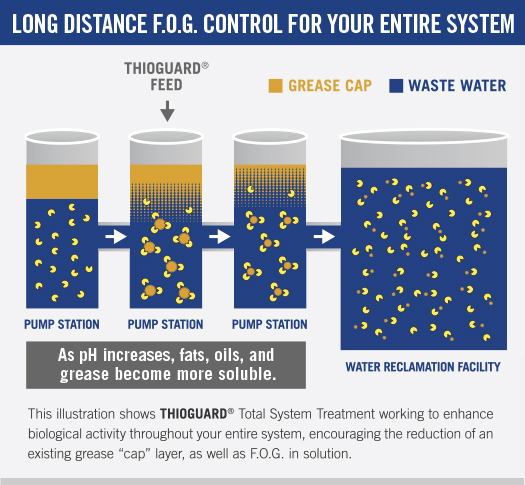 The addition of THIOGUARD® boosts pH levels, THROUGHOUT your system, PREVENTING the conditions that encourage the deposition of grease, which can clog lines, and accumulate on the surface of pump stations and your treatment plant. 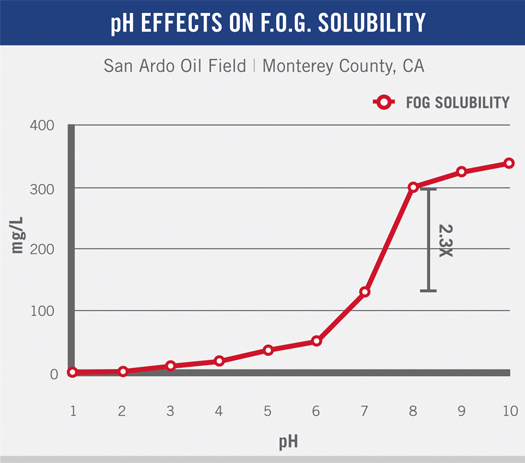 With improved pH, solubility is increased significantly, by a factor of 10x in some cases. THIOGUARD® is typically added through a single Feed Unit, and provides multiple benefits throughout your system, from source to discharge. THIOGUARD® provides the greatest power to neutralize acid over long infrastructure distances, while providing additional benefits to your waste water treatment plant’s biological treatment processes. 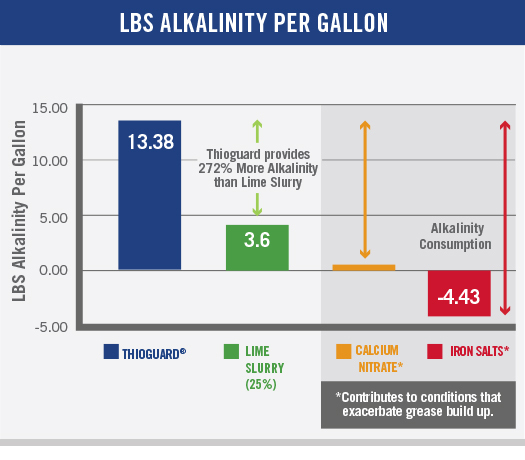 The chart below compares alkalinity per gallon, illustrating the superiority of THIOGUARD® against other commonly used treatment options. The benefits of adding THIOGUARD® to your treatment processes are not limited to the prevention or reduction of F.O.G., through sustainable and balanced pH levels. THIOGUARD® also prevents corrosion and dramatically reduces the formation of sludge – significantly reducing your handling and transportation costs. The benefits are numerous and system-wide, making THIOGUARD® the best and most practical choice for your system.